A corridor that looks onto the gardens of Govone Castle leads to three rooms, each with ensuite bathroom and panoramic balcony. 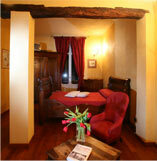 The rooms come complete with every comfort, yet they retain the charm of the original building. The 18th and 19th century furnishings, nailed wood flooring, vaulted brick ceilings, beautiful rugs and old marble fireplaces create an old-world feel, but blend seamlessly with the B&B’s modern facilities. Each room has its own balcony with panoramic view. The spacious bathrooms have stone-clad walls and wood beams, which add a touch of warmth and harmony. from the balcony of each room. This room was converted from the old reception room and is named after the camino (fireplace) in the bedroom area. Its refined décor and cosy feel will ensure you get a perfect night’s sleep. Macine, which means ‘millstones’, is the old grain-milling room. 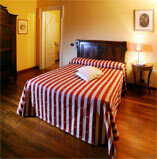 Today it is combination of old, Italian rural style and modern comforts that is perfect for couples. This room was converted from the area where the miller (mugnaia) retired after a hard day’s work. The conversion has given it a warm feel and elegant look. Leave the chaos of the city behind and savour the fairytale atmosphere of Il Molino B&B amidst the vineyard-studded hills of Piedmont’s Langhe, Roero and Monferrato areas. We hope you enjoy browsing this small shrine to Italy, Piedmont and the Langhe, Roero and Monferrato areas. 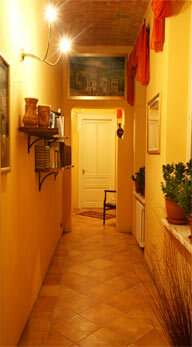 It is a land we love; we were born here and we want our romantic B&B to be part of your unforgettable experience.